Dance Commentary by Heather Desaulniers: Zaccho Dance Theatre - "Sailing Away"
Zaccho Dance Theatre - "Sailing Away"
Last week, San Francisco’s Union Square was its usual bustling self; tourists, shoppers and workers all going about their typical routine. Yet, each afternoon between September 13th and 16th Market Street was the site of much more than daily activities, errands or sight-seeing. It became a place where art and life merged and intersected as Zaccho Dance Theatre re-staged their site-specific, mobile dance theater work: 2010’s “Sailing Away”. 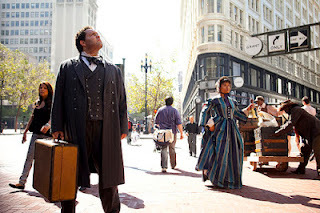 Starting at Market & Powell and traveling down to Battery, eight performers brought “San Francisco’s Black Exodus of 1858” to life, depicting a time more than one hundred and fifty years ago. Faced with hostile threats and increasing racial discrimination, African American citizens departed San Francisco in search of peace, unencumbered prosperity and true freedom. In sharing this historic event, choreographer Joanna Haigood has managed to successfully fuse narrative strength and post-modern sensibilities. Not many dancemakers can accomplish this lofty goal and with “Sailing Away”, Haigood has proven herself once again as an artistic tour-de-force. “Sailing Away” begins with a tableau: eight performers (seven dressed in period costume, one in modern attire) frozen as if they are sitting for a portrait. Then, one by one, they break their position and begin to slowly amble down Market Street. Each cast member had a specific trajectory over the seven blocks: some walked ahead while others stopped in different locations to perform solos, duets or trios before continuing their journey. In addition, there were also moments on the route where the entire group came back together to form picture vignettes. Despite the different configurations and physical vocabulary in the beginning of the work, a common serenity and awareness was present in everyone’s gait. No one was in any hurry, rather, each dancer grasped every possible opportunity to take in their surroundings. Then, as the group got closer to the end of their path, the movement and demeanor changed. The forward propulsion took on more urgency, characterized by wild spinning lifts and desperate chaîné turns. One man, who carried a ship’s anchor throughout the dance, stopped to reveal a violent, tenacious solo variation. Full of shaking, clenched fists, he seemed to be silently screaming, “why?”. “Sailing Away’s” venture down Market Street was a complex one: deliberate and intentional yet labored and haunted at the same time. Alongside the costuming and props, Haigood used structural choreographic tools to highlight the narrative theme. A dynamic combination of solos and group sequences facilitated the story from both collective and individual perspectives. This was clearly happening to a group of people, yet within group, it was affecting each individual in very unique and personal ways. “Sailing Away” also required active participation from its audience. Not only did we follow the eight performers for the length of the piece, but we also chose whether to stop and watch one dance, or to keep going onto what was happening ahead. Your decisions, as a viewer, composed the piece for you: what you saw, what you missed, who you watched and who you ignored. “Sailing Away” is not for the passive watcher; Haigood and Zaccho Dance Theatre have created a choreographic experience that demands a culpable, responsible observer.